Buying weakness and selling strength is the art of buying pullbacks. Stocks that are in up trends will pull back offering a low risk buying opportunity and stocks that are in down trends will rally offering a low risk shorting opportunity. Doesn't it make more sense to buy a stock after a wave of selling has occurred rather than getting caught in a sell-off? Doesn't it make more sense to short a stock after a wave of buying has occurred rather than getting caught in a rally? Absolutely! If you are buying a stock then you want as many sellers out of the stock before you get in. On the other hand, if you are shorting a stock, then you want as many buyers in the stock before you get in. This gives you a low risk entry that you can manage effectively. 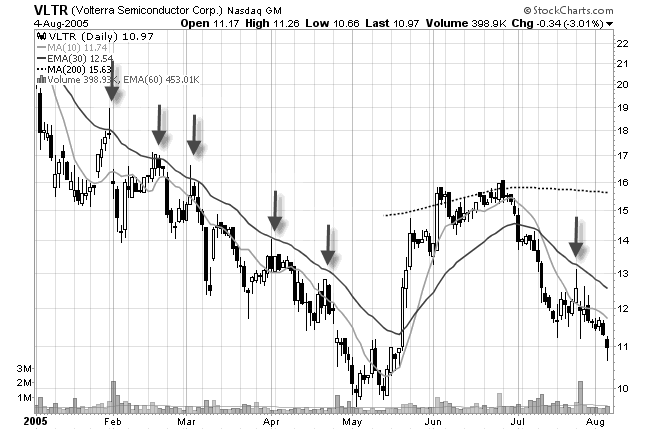 Now you can see how you are shorting stocks after a wave of buying has occurred. When going long, wait for the decline into the TAZ and when going short wait for the rally up into the TAZ. This is the most reliable type of entry into a stock and this is the likely area where institutional money is going to come into the stock. If you only trade one pattern, this should be it! You can get into a stock at the beginning of a trend, at a point of low risk, and you can take partial profits and ride the trend to completion! What more could you ask for? 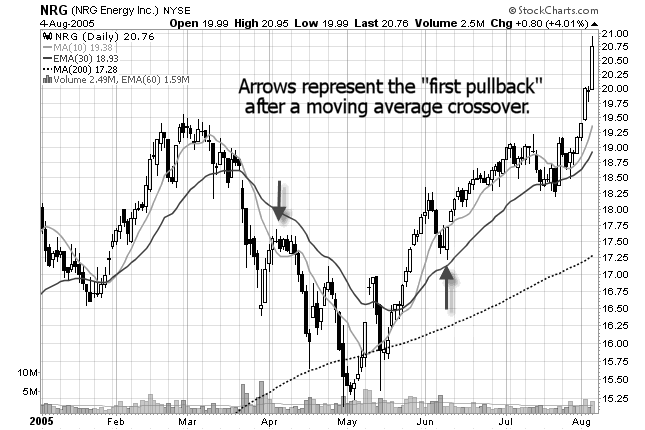 There is one other type of pullback worth mentioning and that is the first pullback after a breakout. If you are looking at a stock that is trading sideways or forming a basing pattern, and it suddenly breaks out of the pattern, you can look to buy the first pullback after the breakout. 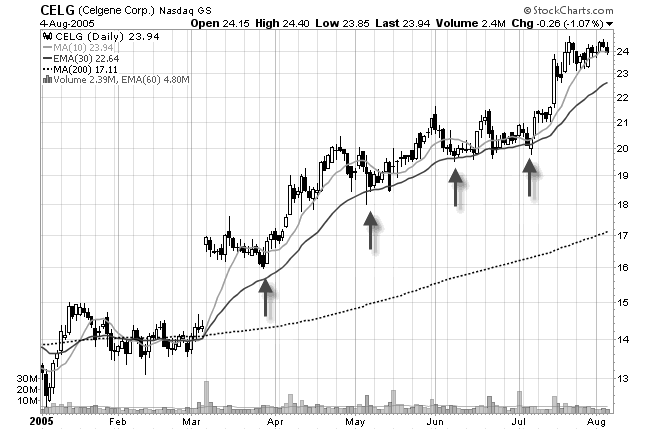 This also gives you a low risk entry into a stock that will likely continue the current trend. Most traders are going to buy breakouts. The word breakouts sounds so exciting doesn't it? The problem with buying breakouts is that it is hardly every low risk. Think about it. If you are buying stocks when everybody else is, then who is left to buy the stock after you get in? 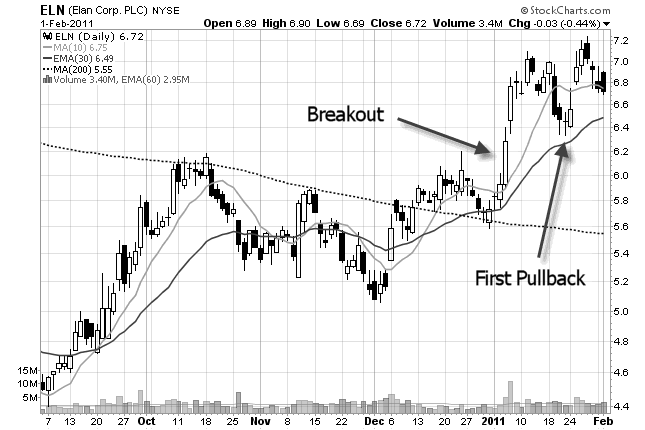 Also consider this: The majority of breakouts fail and return (pullback) to the breakout point! See more first pullback examples on this page. Forget buying breakouts. Step away from the crowd. Wait for the breakout buyers to get scared and sell. This sets up the pullback that you can get into with much lower risk and higher odds of having a successful trade.